Lions and tigers and… giraffes?? Flicking through the contents of February’s issue of the Journal of Zoology, this paper* caught my eye (and how could it not!) – a study using claw marks to study lion predation on giraffes of the Serengeti. Wow! Megan Strauss, a PhD student at the University of Minnesota working with the legendary Craig Packer (synonymous with lion research and the first in a distinguished lineage of PhD students supervised by my supervisor THC-B! ), is the project director of the Serengeti Giraffe Project, where she carries out her research. With an impressive sample size of over 700, she has examined the characteristic laceration scars from wounds inflicted by lions on surviving giraffes to investigate the relationship between Serengeti giraffes and their most important predator – how attacks are distributed among the population and among study sites in the Serengeti, and how lions go about taking down such an unwieldy prey. 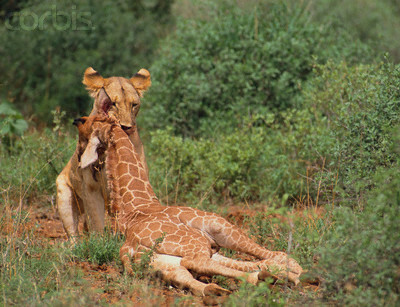 A lack of claw marks on young giraffes suggests that calves are unlikely to survive attack. Claw mark prevalence was higher among females than males – as adult males are more often solitary, and in dense vegetation, they may be more susceptible to lethal attack. And, females, though they behave less riskily by staying in larger herds in open areas, may acquire these scars through defence of calves. Lastly, giraffes living in the study site with more open habitat where they aggregate in larger groups had fewer claw marks – so it seems that, as in the meerkat, group living has its perks! First paper now available online! I’m delighted to finally be able to share my first ever paper, now published online in Animal Behaviour. See abstract below!